While you probably can't tell, I'm trying to eat healthier. I got a big pack of sprouts from Wholefoods yesterday, and whipped up a quick dressing and had a delicious salad. A healthy one. If you want to be even healthier, use 1 T flaxseed oil in place of one of the tablespoons of olive oil. Mix together the garlic, mustard, vinegar, and wine in a small bowl. Beat in the oil with a fork or small whisk, a little bit at a time until the dressing is smooth. 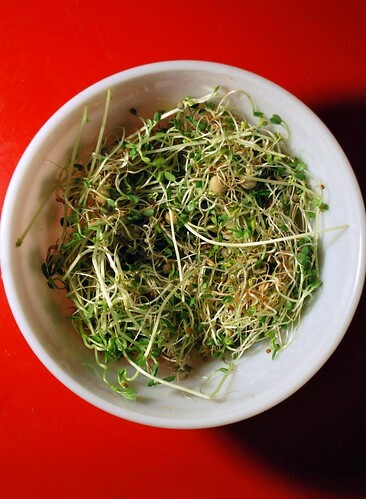 Taste for salt and pepper, and pour over your sprouts and mix together. I just wanted to say you have beautiful photos on your blog! Mmmmm...I love sprouts. 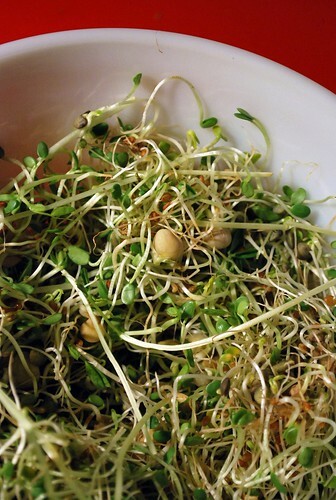 If you're mixing them for a salad and can find them, onion and broccoli sprouts add a huge ZING to sprout mixes. That first photo is extra gorgeous! Wow! And that salad sounds good; so fresh. 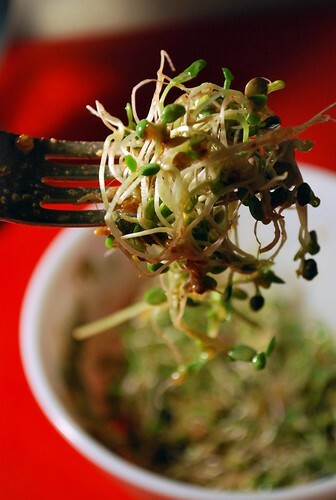 Sprouts are one of my favorites...I love their texture, especially in a big salad or on a sandwich. I haven't had them for so long. I don't know why - sometimes an item I love just falls off of my grocery list and then something reminds me to put it back on. The salad looks fabulous. I just might be in love with your sprout salad. You are such a talented cook. You never cease to amaze!